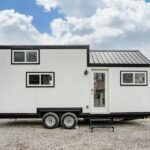 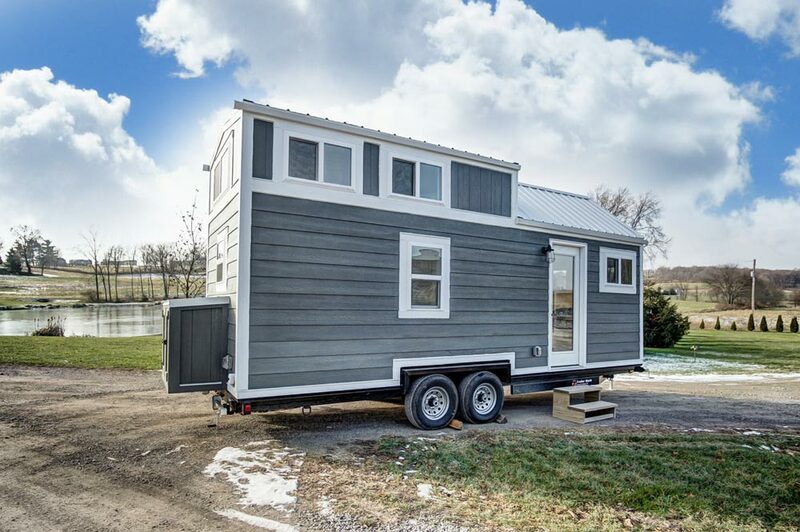 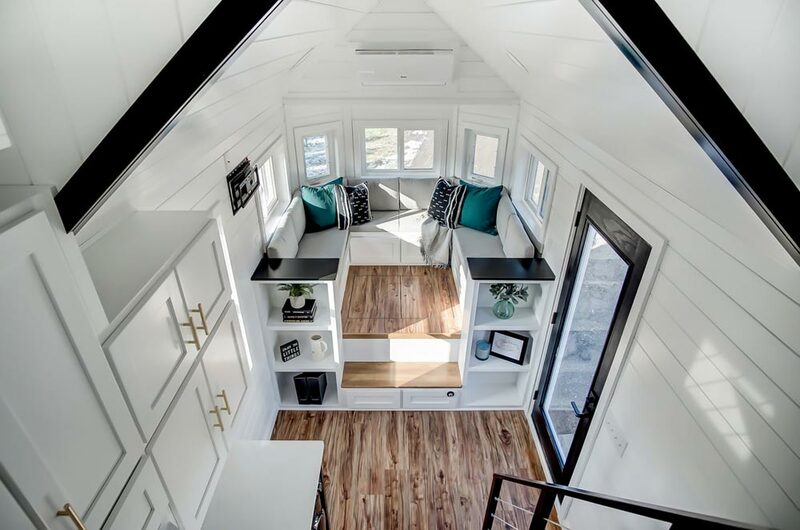 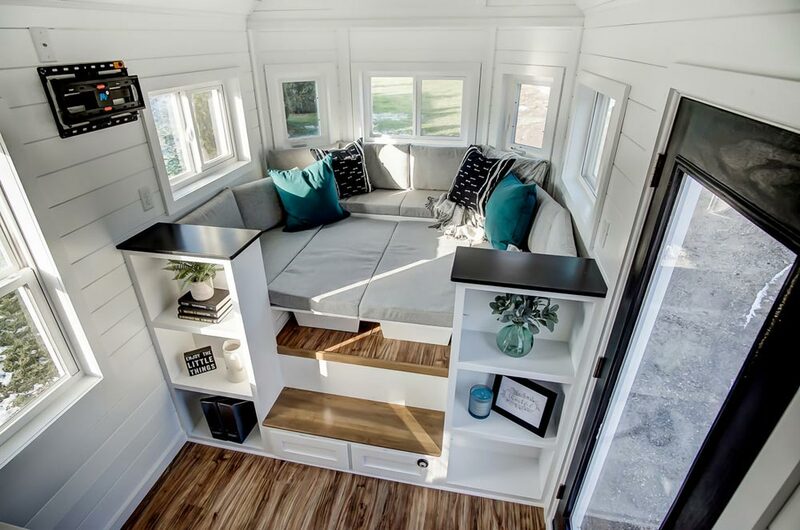 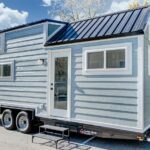 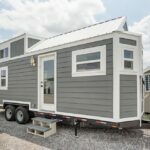 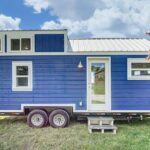 The Braxton is a 24-foot tiny home built by Modern Tiny Living and based on their popular Kokosing model. 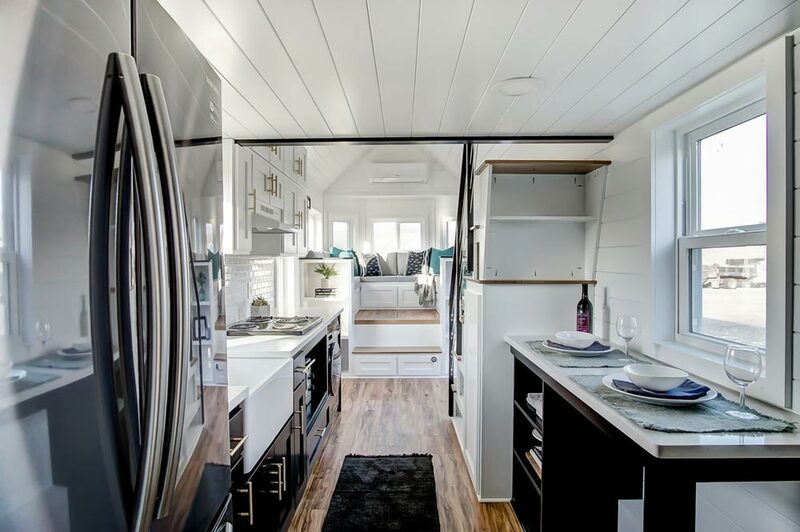 The home includes their functional and stylish social area. 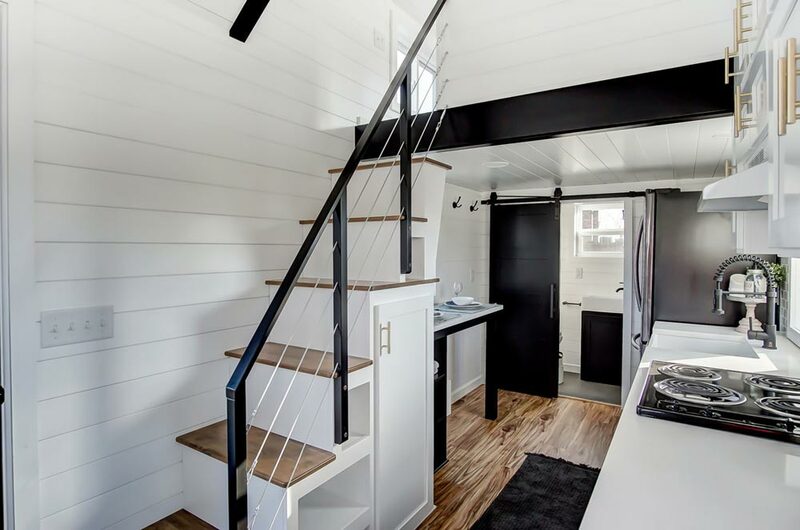 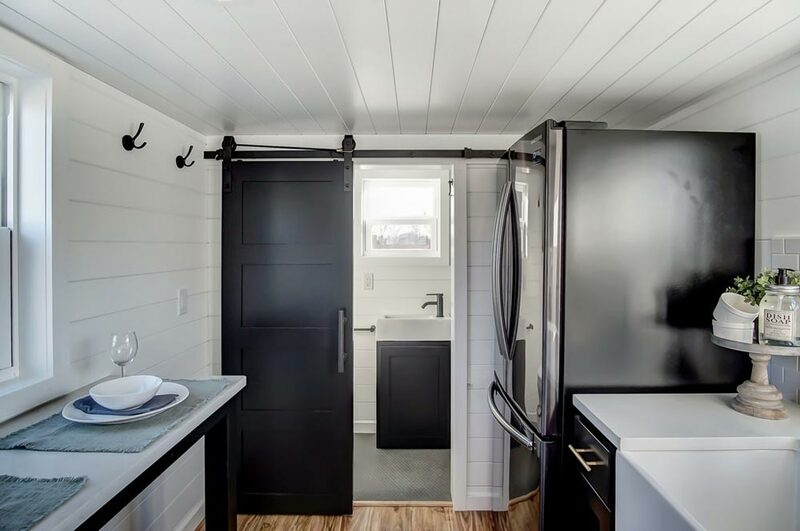 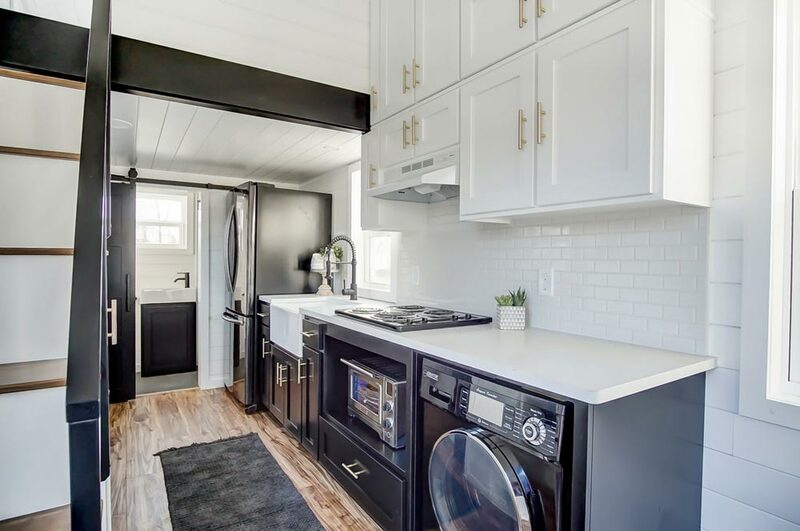 The 256-square-foot home was built on a 24-foot Trailer Made custom tiny home trailer. 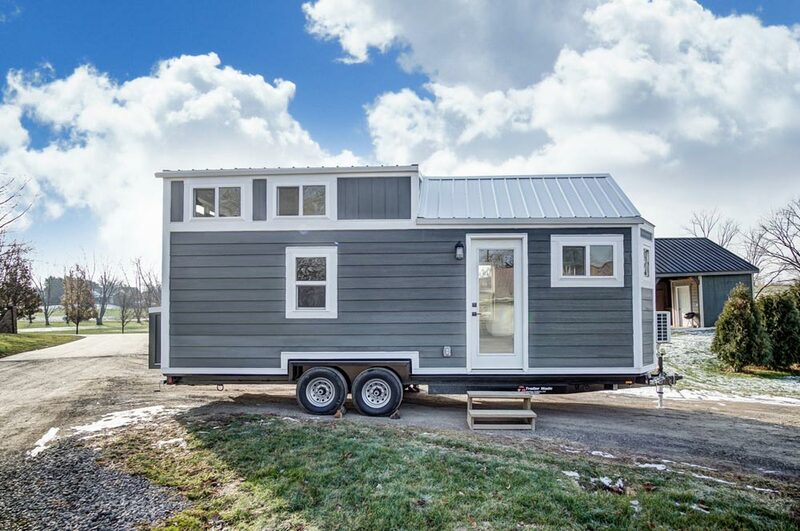 The exterior is clad in gray Smart Siding with white trim and a steel roof for a long-lasting, low maintenance finish. 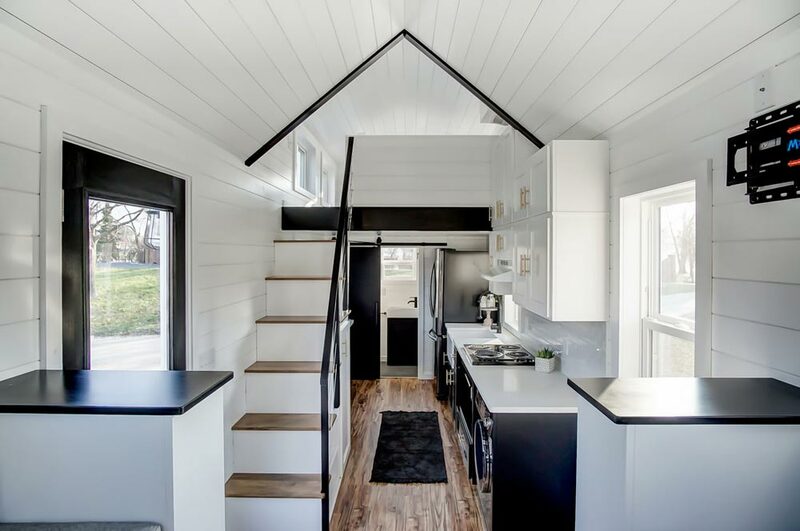 A full light door leads into the home. 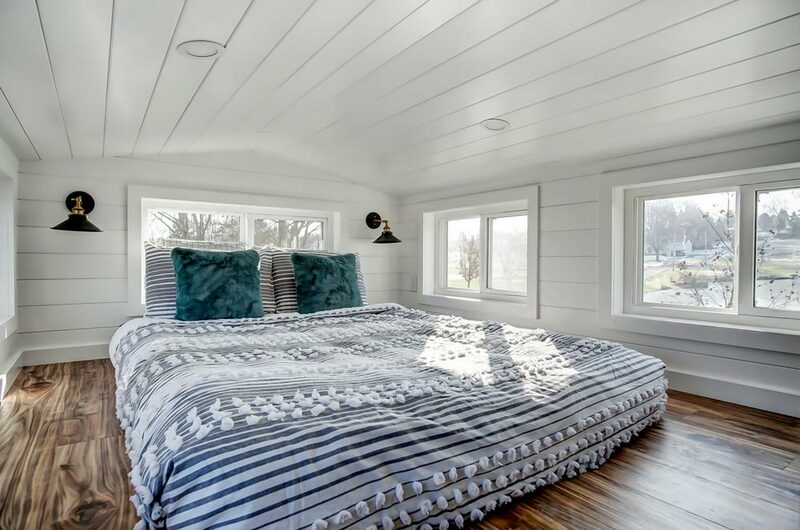 Inside the Braxton are hickory hardwood floors, white painted poplar walls, and black cabinets and trim. 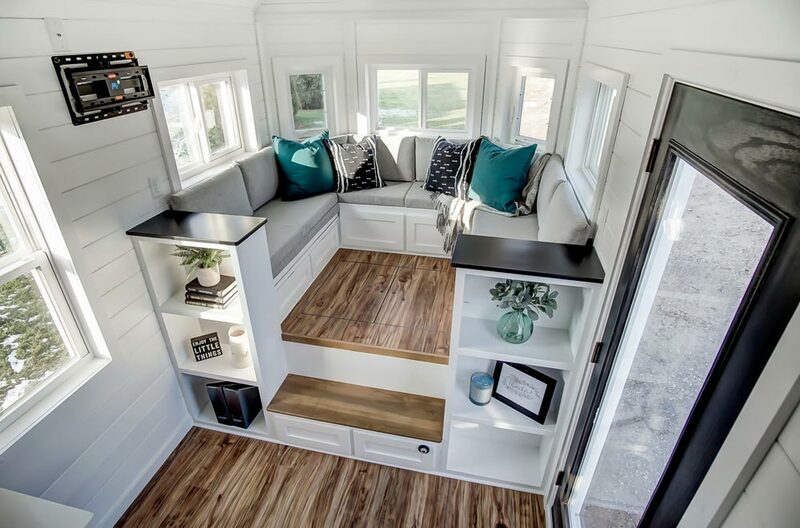 The social area has a raised platform with large doors to access the storage space underneath. 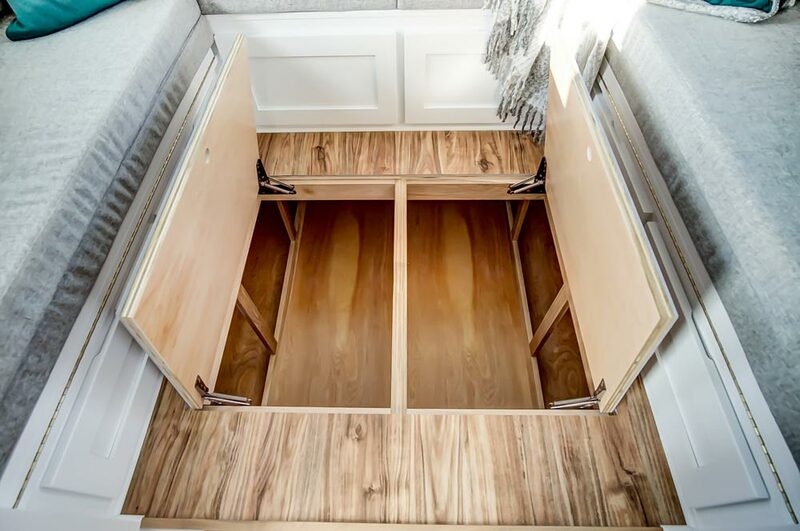 The U-shaped built-in benches each have two drawers, plus there are drawers that pull out from the bottom step. 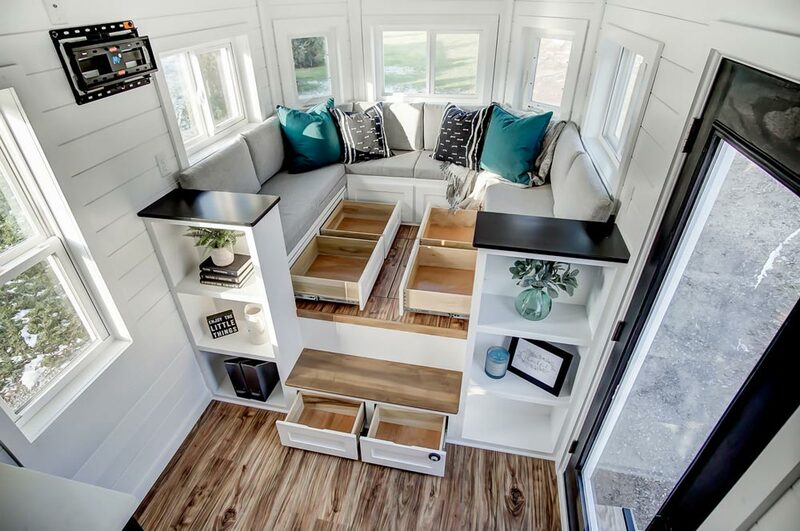 The benches fold out to create a guest bed that sleeps two. 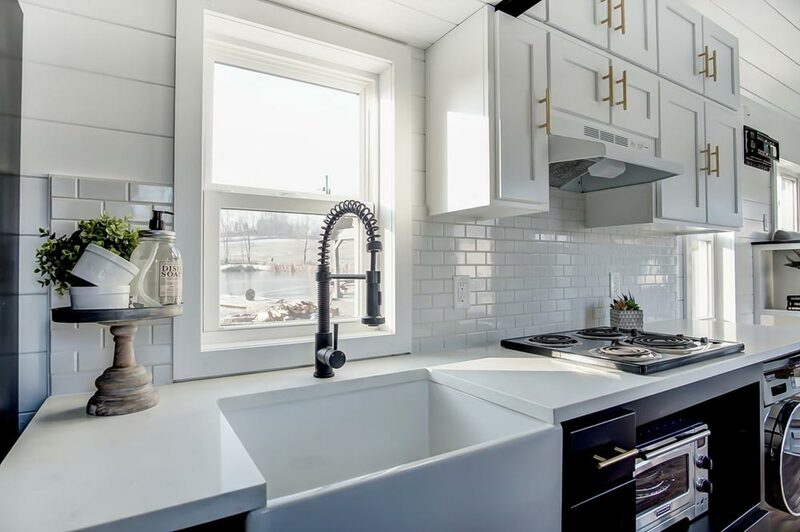 The gorgeous modern kitchen features white quartz countertops, a 30″ white farmhouse sink, a white subway tile backsplash, and custom black and white cabinetry. 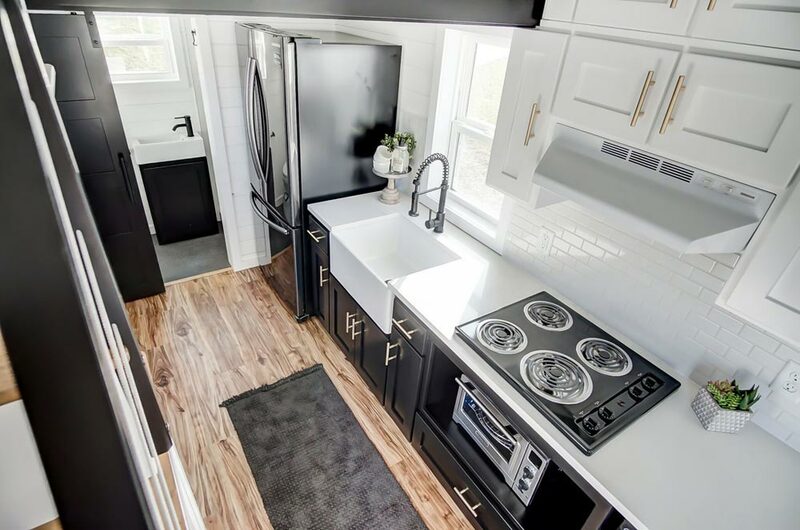 Appliances include a four burner electric cooktop with hood, convection oven, 33″ refrigerator/freezer, and a washer/dryer combo. 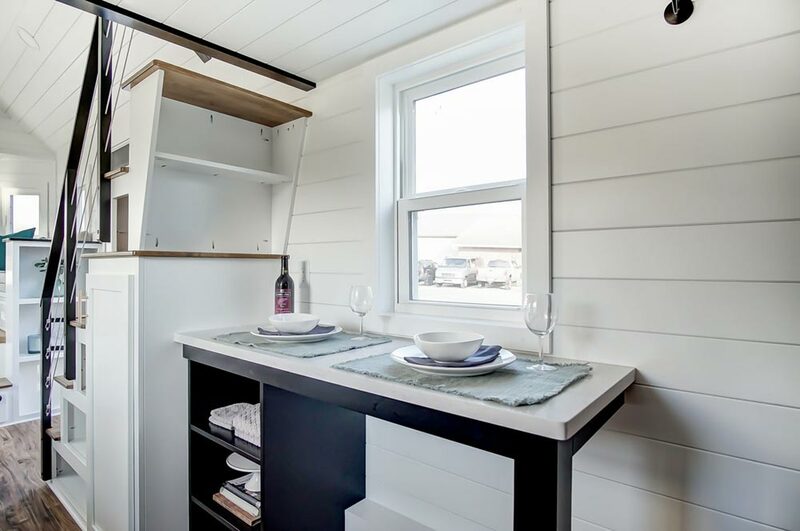 Across from the kitchen is a dining area and storage stairs. 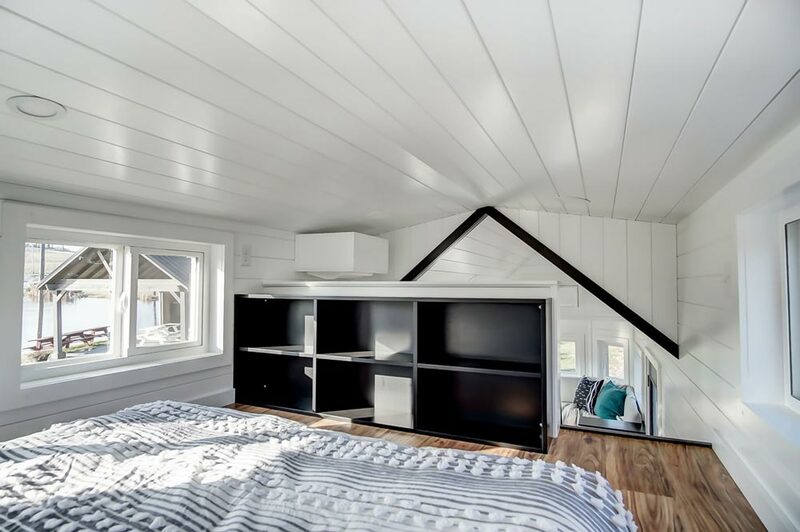 The stairs lead up to the bedroom loft that is large enough for a king size bed. 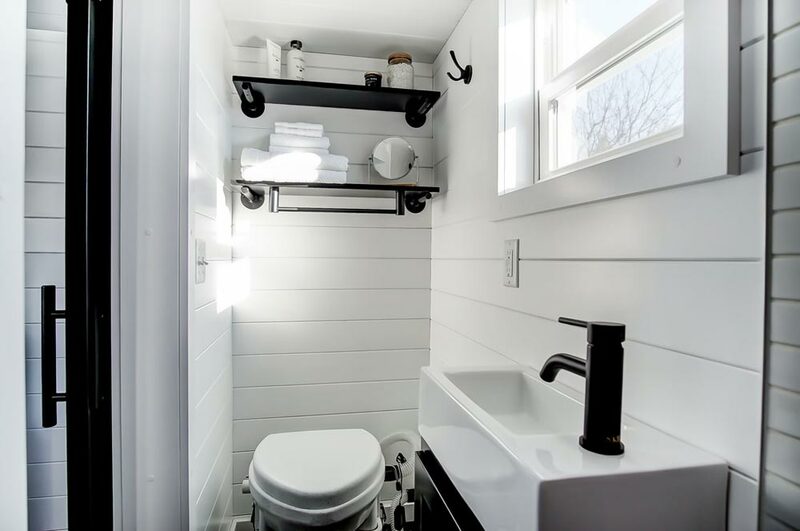 A built-in storage area doubles as a partial privacy wall. 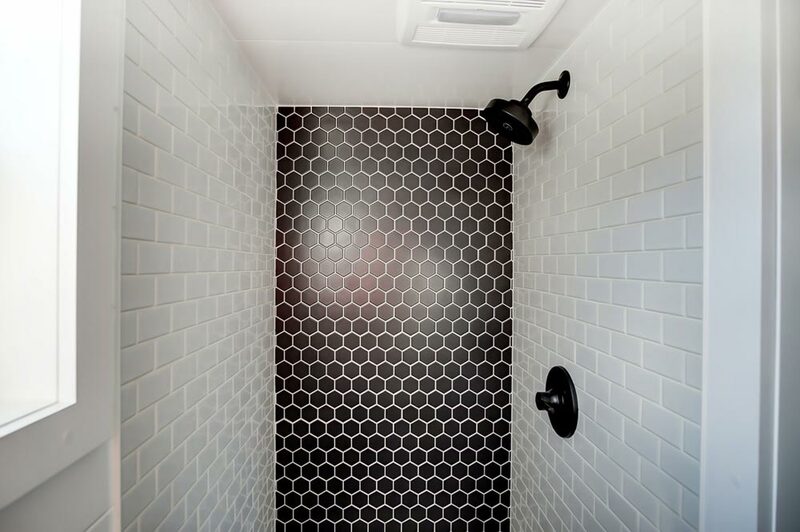 The bathroom includes a black penny tile floor, shower with black hexagon and white subway tiles, modern sink, and a composting toilet. 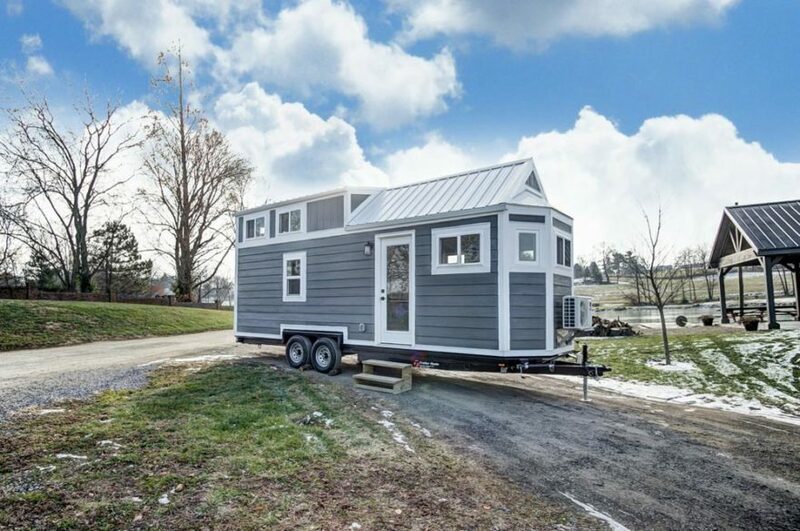 The Braxton costs approximately $89,000 as shown. 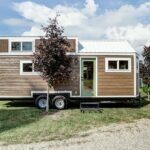 For more pictures and details about the tiny house, please visit Modern Tiny Living. 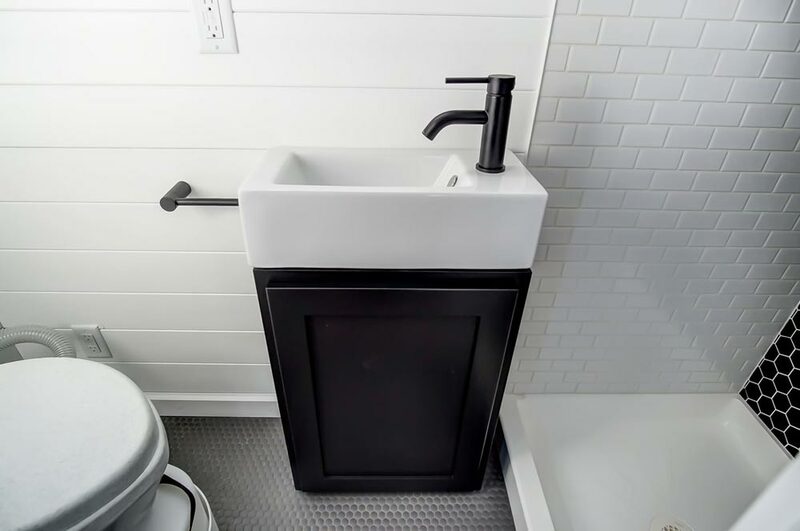 Also available from Modern Tiny Living: Kokosing, Kokosing 2, Ocracoke, Braxton, Clover, Fox, Grand, Lodge, Domino, Rodanthe, Nash, Pearl, Poppy, Point, Aqua Oasis, Blue Oasis, Latibule, Mohican, Espresso, Cocoa, Nugget.